Live on Tuesday, 15 November at 22:00. The possible resignation of the current head of the State Fiscal Service was the hottest topic in Ukrainian politics in June. Since then, however, nothing has changed. Roman Nasirov still runs the main fiscal body, tax reform still has stalled, and the head of the Transcarpathian customs, whom Governor Hennadiy Moskal has defended so vigorously, was dismissed (soon after Moskal's interview on the Left Bank with Sonya Koshkina, where he spoke about that). What to do with the decapitated Transcarpathian and Odessa customs, and all the other customs of the country, whom the prime minister has accused of total corruption; how the lawsuit of Marushevska against Nasirov is moving on and when we should expect actual changes in the tax system. 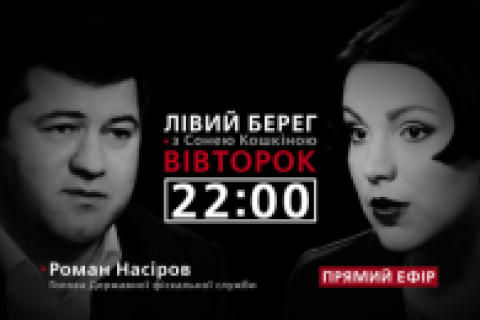 The head of GFS Roman Nasirov will answer these questions on Tuesday, November 15 live on the program Left Bank with Sonya Koshkina at 22:00 on TV channel 24. The text version is to be posted on LB.ua shortlyafter the show.